My children will never let me forget this: while on a Carter-era family vacation to Florida, I pulled into a gas station and abruptly drove off, announcing, "I'll be damned if I will pay $1/gallon for gasoline." With each passing mile on I-75, the prices got higher and I became even more frustrated. Finally, I had no choice but to pay the price because the car was running on fumes. Then I watched the kids snicker in the backseat as I pumped the gas. That trip came to mind when one of our loyal subscribers, Terrie N., wrote in asking for a commonsense explanation of inflation. In short, it's an expansion of the money supply. As our government circulates more money, the value of each dollar goes down. Most of us think that products and services are getting more expensive, but really the buying power of the dollar is dropping. Here's another way to look at it. If a company is worth $1 million and has issued a million shares of stock, then each share is worth $1. If the company has a two-for-one stock split, the company is still worth $1 million, but each share is now worth $0.50 because there are twice as many shares. After the split, if you sell the stock to buy a new car, the car will cost you twice as many shares. The car did not get more expensive; the value of each share declined. So it is with money. How Much Does It Take to Keep Up? To answer that question, consider the fictional Joe Smith. Joe got his first "real job" in January 1994, so he will soon finish 20 years on the job. His starting salary was $50,000. Today Joe is in his forties and raising a family. Despite receiving promotions and salary increases along the way, he finds himself living from paycheck to paycheck. It is natural to assume that it's mostly due to the cost of raising a family. However, according to the Bureau of Labor Statistics' (BLS) inflation calculator, Joe has to earn $78,997.64 today to maintain the buying power he had his first day on the job. Quite often, inflation occurs right under our noses. During periods of high inflation, as you may recall from the Carter years, the toll on one's savings is painfully obvious. In a recent article, we looked at a hypothetical investor who bought a $100,000, 5-year, 6% CD on January 1, 1977. He was in the 25% tax bracket. At the end of five years, the balance on the account was $124,600. 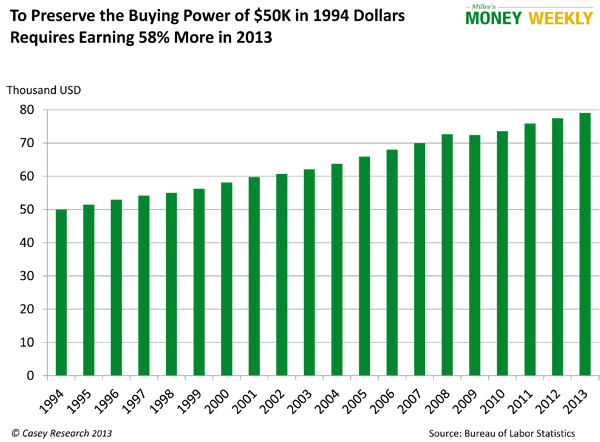 While it sounds like more money, his buying power had actually dropped by 25.9% because of inflation. If, on January 1, 1977, a luxury car cost $25,000, he had enough to buy four of them. Assuming the price of that car rose with inflation, it would have cost $37,500 five years later; he would have had enough for just three with a little gas money left over. I realize no one needs three or four cars, but you get the picture. Inflation feeds the illusion of wealth, but it is just that: an illusion. The key is to maintain and grow your buying power. If your income does not keep up, you are getting poorer by the day. Inflation is good if you are a debtor with fixed-interest debt and a rising income. It allows you to pay back your debt with cheaper dollars. For people living on a fixed income, however, inflation is a nightmare. That includes many retirees and working-class folks pushed into part-time jobs. So who benefits the most? As the world's biggest debtor, the US government has the most to gain from inflating the dollar. During the Carter years, incomes rose and people were pushed into higher tax brackets, but their money bought less and less. Eventually, the public outcry got so bad that Congress indexed tax brackets to the inflation index. Having lost one strategy for silently raising taxes, the next step was to do what all governments do—lie! Both political parties are in on the game; this is not a partisan issue. They work together to rig the official inflation numbers, which keeps Social Security payouts low, tax brackets inaccurately adjusted, and interest on many government debt instruments lower than they should be. In addition, all of the Treasury debt that is outstanding at a fixed rate is much easier to repay. Lying about the true rate of inflation saves the government a lot of money. Some prefer to call it "creative accounting." A recent article in USA today stated that the 2014 Social Security increase will be one of the lowest in years—likely 1.5%. I called my health insurance carrier to find out what my Medicare supplement premiums will be for 2014. They could not tell me the health premium, but the drug premium is going from $15 to $21 per month. That is a 40% increase. Sad to say, it gets worse. The government is also considering a gimmick called the Chained CPI, which is just another way to fudge the inflation rate. The bottom line is: The government owes us money, and how much it pays is based on an index. At the same time, it is also the scorekeeper. Hey, nobody ever said it was fair! How Can We Manage Inflation? Acknowledge the difference between needs and wants. Apple recently introduced a new, faster iPad. One article predicted that close to half their sales would be to people who want to own the hottest, newest technology on the market. When you are concerned about retirement, which is better: showing off for a few days or using your old iPad and letting that $500 grow in your retirement account? We don't have to be misers, but use some common sense. Pay yourself first, and learn to live on the rest. Today, most folks save for retirement wealth through IRAs and/or 401(k)s. Many an accomplished saver will share their secret: The money is deducted directly from their paycheck—or each payday, the first check they write is to savings—and then they live on the rest. Invest in education. It makes little sense to be an accomplished saver if you are a poor investor. Recently I shared some tips on growing your retirement account while you are still working. The sooner you learn to manage your finances, the closer you are to true independence. Maintain perspective. The goal is to build and accumulate wealth each year and stay ahead of inflation. There is some room for speculation in a retirement portfolio; however, low risk and steady growth comes from picking the right vehicles, diversification, and patience. As Benjamin Franklin said, "He that can have patience can have what he will," but that patience is sometimes hard to come by. Too often people feel the need to catch up, so they take huge risks. Later on, they realize a steady and conservative approach would have worked better. Don't let the numbers fool you. There was a time when having a million dollars meant you had it made. Today, a million dollars invested in ten-year Treasuries will yield around $25,000 in interest, before taxes. That is a far cry from having it made. You can beat inflation. While the market is a lot tougher than it was a decade ago, those who make the modest time commitment necessary to research and learn can stay ahead of the curve. It is my personal mission to give our subscribers the tools to do just that—efficiently and effectively. That's why I put together a short explanation of what it means to retire successfully, and how Money Forever can help you get on track. You do not have to go it alone. I urge you to take a few minutes, sit back, and read all about it. Start your retirement education right now by clicking here.